Though it sounds crazy to the average person who still thinks electric vehicles are Rascals and golf carts, electrics make fantastic drag racers. We've covered them here plenty, and I've even tried it. But they're by no means perfect, for the same reasons as all electric cars: batteries and infrastructure. But I have a plan. First, let's go over why electric cars can make such wonderful dragsters — there's three main reasons, and they're all torque. Except the middle one, which is torque as well. Electric motors make their full twisting-power right from a dead stop. The moment you step on the potentiometer pretending to be a gas pedal, that electric motor will twist those tires with full force, unlike a combustion motor, which needs to get to an optimal RPM to deliver full torque. That means, essentially, an electric car can take off incredibly fast. Which is what drag racing is all about. The cars are well-suited to drag racing — so what's the problem? The problem, as I see it, is twofold: batteries and boredom. Let's start with batteries, the achilles' heel of all electric cars. Batteries are heavy, expensive, and just don't ever seem to hold as much energy as you'd like. On top of all that, they can be pretty severe fire hazards as well. For most electric cars, however, they're still the best thing we've got, and we're making the best of it. But for a dragster, which only has to go, what, a 1/4 mile at a time, batteries and range don't have to be such an issue. You'd still need big battery packs in a dragster, since even though the distance is low, the power demands are still high. And those big battery packs mean weight and fire danger, two things drag racers want none of. So I say let's just get rid of them. How? I'm glad you asked, disembodied voice in my head. It's nice of you to take an interest instead of always demanding I kill Disney characters. Here's how: since a dragster is only really designed to run on a drag strip, let's provide the electricity through the dragstrip itself! It would be, essentially, like a slot car. Drag strips would have a central channel with conductive strips on opposite sides, which would receive a conductor from the dragster itself. Sort of like a streetcar-type setup, but with the conductor below instead of above. Or, again, a slot car. The spring-loaded conductor would slot down in to the channel and send power to the dragster's motor. Ideally, it would be designed in such a way as to shower sparks periodically (safely, but this fits in with the second part of the solution). Without the burden of batteries, the dragsters could be built very light and with massive, power-hungry motors. Eliminating the battery packs would also drop the costs of building and maintaining a dragster significantly, opening up the sport to many who would normally never be able to participate. Power would be supplied by normal municipal power systems, which, if those are operating via clean, renewable sources, would make drag racing a very eco-friendly affair. Also, when decelerating, the dragsters could employ regenerative braking techniques to put energy back into the system via the same conductors. Now, for the second part of the problem, we have to think less rationally. See, half the fun of drag racing is the noise, the smoke, the smells, the flames shot out of exhausts, all that good stuff. Electric car drag racing as it stands now is too clean, too quiet, too... civilized. I've seen electric car drag races that felt positively librarian. For electric car drag racing to really take off, it needs to get a bit showier and more ridiculous. There's no smoke or loud exhaust booms or (ideally) fire, but electric motors and electricity does have its share of powerful, loud, and thrilling tricks. Sparks, for example. Showers of sparks are at least as good as clouds of exhaust, and the conductors can certainly provide those. But the real trick here will be to up the showmanship ante a lot, and the way to do that is with an old reliable friend, the Tesla Coil. Lightning. Imagine a drag race, but with massive amounts of lightning. A Tesla Coil would be mounted halfway down the dragstrip, and would be shooting sparks and arcs and all that. The dragsters would be equipped with standing conductors, so as soon as they approached, massive bolts of lightning would strike the cars as they sped by. 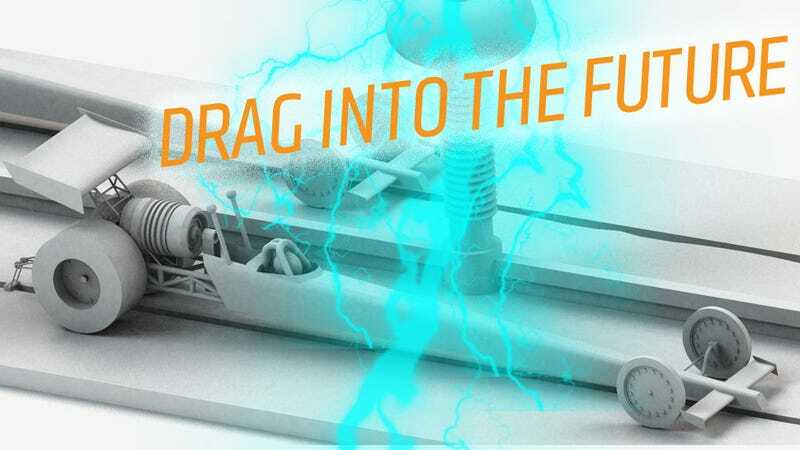 The driver and sensitive electronics would be contained within the dragster's roll cage, which would act as a Faraday cage in this context to keep everything safe. There'd be huge cracks and booms of the arcs striking, there'd be that electrical ozone smell, and of course the visuals of the arcing electricity — it would have it all. Admit it — it would look incredible. Also, driver skills would be very similar to what's required with conventional drag racing, with perhaps an extra element thrown in: it would be possible, if you wavered too much from your line, to unplug your car from the power channel. This would mean loss of power, and, possibly, the race, though a skilled driver may be able to correct and re-enter the power channel. How this would happen would depend a lot on the design of the conductor system, and would also have a safety benefit as well: if a driver loses control, the car is automatically cut off from power, and it should be clear how much that could help mitigate accident severity. So let's break it down: extremely fast dragsters, potentially much less environmental impact, plenty of auditory and visual stimuli, safety benefits, and fairly reasonable costs of entry. What's not to like about this form of electric drag racing? I'm sure you'll tell me below, but I'd still love to see this happen. Maybe my pals at Irwindale will be willing to take the leap? They already have experience with racecars that shoot sparks.